Camp for €18,- a night at Campsite Uvala Borova in low season with CampingCard ACSI. 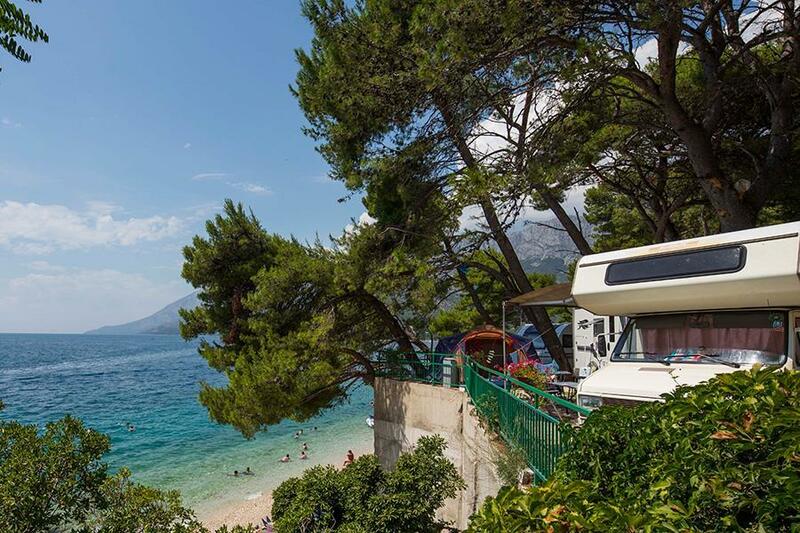 Campsite Uvala Borova, located in Podaca (Split-Dalmatia), is a campsite with 93 touring pitches and 3 year round pitches. With your CampingCard ACSI you can camp on one of the pitches during the following periods: 01-04-2019 - 29-06-2019 and 01-09-2019 - 29-09-2019. At this campsite you can not only use your CampingCard ACSI for inexpensive camping, you can also use your ACSI Club ID (as an alternative ID). A friendly terraced campsite by the sea with views of the setting sun. Shaded pitches. Peaceful, child-friendly and clean. Free wifi on the site. Trips out in the surrounding area possible (Dubrovnik, Korcula, Hvar, Medugorje). Restaurant and supermarket. Plenty of watersports opportunities. The reception personnel were extremely helpful and friendly. Staff member Irena was particularly helpful and spent over an hour on the phone and the internet helping me find a part for our camper.... much appreciated! Over all, I would recommend this campsite. - Nice setting under tall pines with many views of the water. Most of the pitches have good shade but there are also a few that are more sunny. - Decent beach directly below the bottom row of pitch sites. - Good restaurant on site, although the loud, up-tempo music caters to the younger crowd. The irritating music would keep me from returning. Also a good store for basic food is on site. - There is a nice pizza place next door to the camp restaurant with good pizza and quiet with no music, just the sound of the waves. - The narrow road that goes through the bottom of the site is public but not frequently traveled by vehicles and makes for a nice 1.2 K walk or bike ride along the water to a nice town with beach-front food, etc. - There are some very nice looking pitches near the water with great views and even though the public road runs right behind them, I would not hesitate to set up camp on one of them. -The site is terraced on a steep slope and some of the pitches on the terraced section are not level. - The toilet block is about 1/3 of the way down from the top of the slope, so getting there and back requires steep steps. There is only one semi-level pitch for a camper on the same level as the toilet block, so this site is not very handicap friendly for those with mobility issues. The flattest pitches are at the bottom of the hill which means more hill walking for those choosing to pitch there. Calm and well-kept campsite with clean sanitary amenities. Within walking distance of a village. Friendly and approachable and always willing to help. Mooie en gezellige camping mooie grote percelen, graag nogmaals hierheen. Vriendelijk personeel, proper sanitair top. Would you like to book Campsite Uvala Borova or request more information? You can do both using the information below. Follow coast road. Turn right after Podaca campsite signs. Campsite clearly signposted. CampingCard ACSI will send your information request to "Campsite Uvala Borova".